Ex-IRS Official Lois Lerner last year accused Republican congressional investigators probing the IRS targeting scandal of being "evil and dishonest," insisting later that she was "never a political person." First reported by Politico, emails unearthed by the Senate Finance Committee report published last week suggest that Lerner pled the Fifth Amendment and refused to testify before the House Oversight and Government Reform Committee multiple times in 2014 out of spite. "They called me back to testify on the IRS ‘scandal,’ and I too[k] the 5th again because they had been so evil and dishonest in my lawyer’s dealings with them," Lerner wrote to a friend in March 2014. About three months later, Lerner claimed to the same individual that a physically unflattering picture of her testifying before the congressional committee had emerged because "it serves their purposes of hate mongering to continue to use those images." "I was never a political person—this whole fiasco has only made me lose all respect [for] politics and politicians. I am merely a pawn in their game to take over the Senate," Lerner added in the June 2014 message. The Senate report found that Lerner, who headed the IRS’ Exempt Organizations Unit during the time of the conservative group targeting, "failed to adequately manage" members of her staff processing conservative and Tea Party groups’ applications for tax-exempt status. As a result of her "deliquent" handling of the applications, only one conservative advocacy group was awarded tax-exempt status by the IRS between February 2009 and May 2012. "Lerner’s bias against these applicants unquestionably led to these delays, and is particularly evident when compared to the IRS’s treatment of other applications, discussed immediately below," the bipartisan report concluded. In an earlier email brought to light by the congressional report, Lerner suggested that the country might need to "split in two" because of disagreements between Democrats and Republicans regarding government spending. "We’re in Ohio for the holiday and waiting to go over the fiscal cliff!" she wrote in December 2012. "I truly believe this country is out of its head with ridiculousness! We really need to split in two—we are so polarized that we can’t do anything constructive." 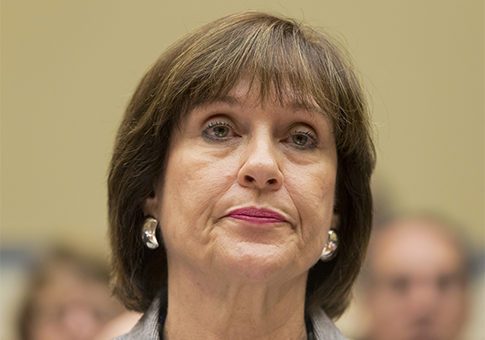 Lerner assumed her top position at the IRS in 2006. Four months after admitting that the IRS targeted conservative and Tea Party groups in May 2013, Lerner was forced to resign from her post at the government agency. In the wake of the Senate Finance Committee report’s release last week, Senate Majority Leader Mitch McConnell (R., Ky.) slammed the Obama administration for misleading Congress and hiding evidence in order to conceal the targeting scandal. "The report makes clear that civic groups were harassed specifically because they identified as conservative," McConnell declared. "It underlines the seething contempt partisan officials like Lois Lerner had for them." Multiple lawmakers have demanded that President Obama fire current IRS Commissioner John Koskinen for hindering the congressional investigation into the IRS scandal. This entry was posted in Politics and tagged Barack Obama, IRS, Lois Lerner, Mitch McConnell, Tea Party. Bookmark the permalink.